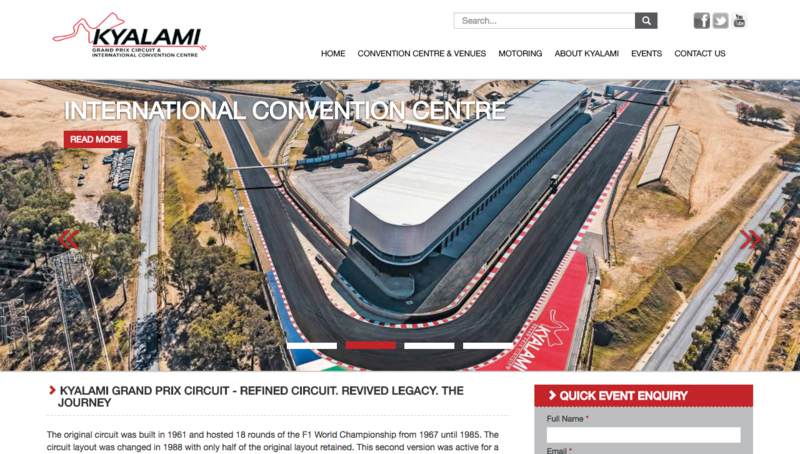 Absol welcomes the internationally renowned Kyalami Grand Prix Circuit as one of our new clients and is proud to announce the successful development and launch of their brand new website. The iconic Grand Prix circuit, first opened in November of 1961, has undergone a massive refurbishment and was relaunched in 2016 as the Kyalami Grand Prix Circuit and International Convention Centre. Having played host to major events like the SA Festival of Motoring, the launch of the new Audi R8 sports car in South Africa, the new Porsche 911 Turbo to the international press, the DSTV Delicious Festival and the Kyalami Motorsport Festival in 2016, the facility has positioned itself as the premier conference/event/convention venue in South Africa.